As I wrap up another wonderful semester at SMU, I get to reflect on a class that I took that I felt was absolutely essential in pursuing that nerve-wracking, somewhat dreaded, always exciting “next step” in my life. For the first time in my life, there hasn’t been a definitive next step. After elementary school, it was getting ready to switch classes in the middle school setting. Then, it was preparation for high school. Then college apps, then college, etc, etc, etc. But as I fly home on my last ever “Christmas break” from school (well, unless grad school happens…), I get to reflect on that. However, this is not what this about. Rather, I want to reflect – gush, rather – on the course that I just wrapped up at SMU taught by Professor Jake Batsell, Digital Journalism. It is a j-school capstone class, one that is comprised of mainly seniors. From guest speakers who graduated from SMU who are now working in the field to his regular lectures, I learned a great deal from this course. Regardless of what I’ll be doing in 5, 10, 50 years, I know that the knowledge and heart that Batsell instilled in us this semester will live with me forever. There were more takeaways from this course than your average college course (not that SMU has any of these, however). Batsell is technological wizard with a heart of gold. So, THUS, he was able to help me through some of my struggles with the technical elements of the class that didn’t come as easily to me (I wasn’t the only one). No, coding is not my forte, but he taught me to have confidence with it and I know that I’ll use at least a bit of this in the future (or maybe a lot!). Only time will tell. Most importantly, he was able to take a look at my StageD214 Blogsite for my Engaged Learning Project and give his opinion on it. He gave me suggestions that I could incorporate almost immediately. I am very grateful for his help in this area, as I hope that my blog will continue as an outlet and resource for SMU students for a long time. In the spring, I’ll be taking an advertising course called Technology Marketing and Advertising, which I assume will be an extension of Digital. Professor Mark Bunting, a former TV host, will teach the class, and I am looking forward to what I can learn from him! To see ZOOT SUIT at Cara Mia Theatre Co.! 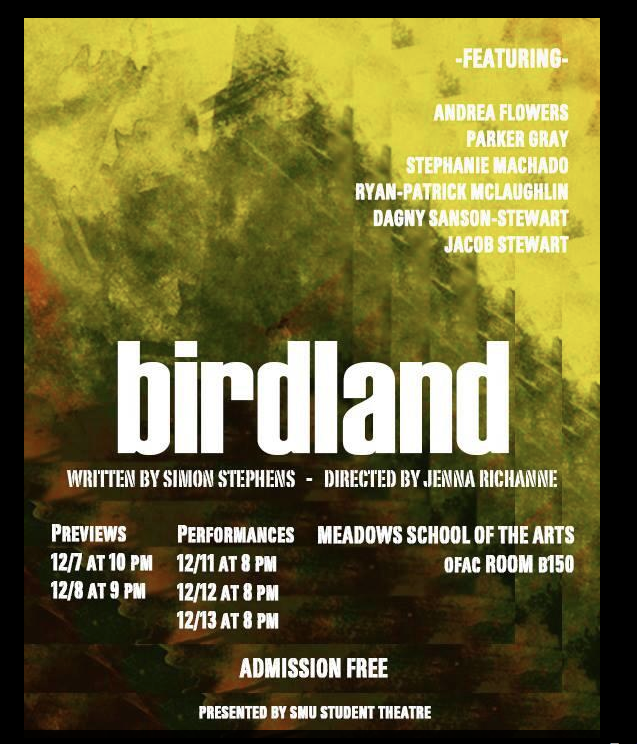 Don’t miss this production, which runs until Dec. 21st. Check out Nancy Churnin’s review in the Dallas Morning News/Guide Live Arts of the show. I thought I would post about my initial experience with ONCE when I saw it in the West End over a year and a half ago now with a dear friend. From the moment I walked in the house, ticket in hand (only 25 pounds! ), I was immersed into the world of the play. 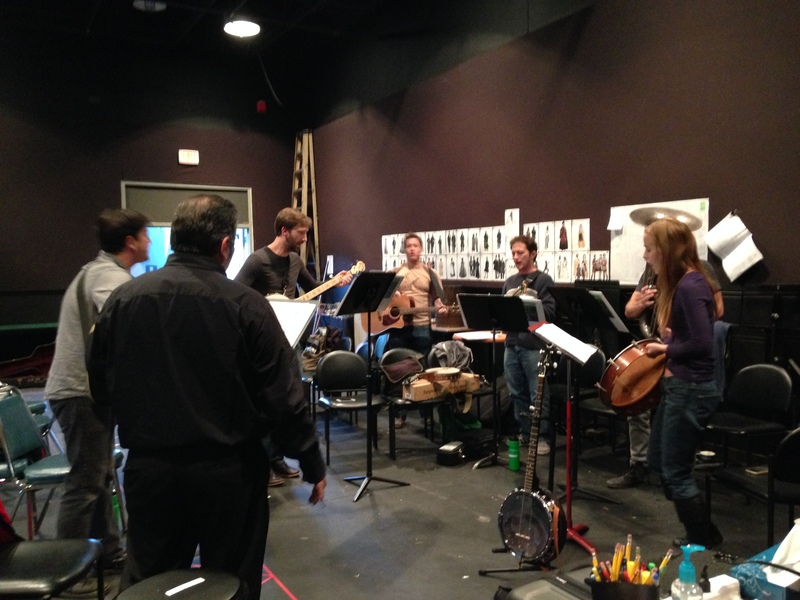 Before the show even started, the cast got onstage, playing traditional Irish songs and interacting with us. We were even invited onstage to get a drink since the show is set in a pub (I bought an Irish beer of course). When the lights dimmed, I didn’t blink until curtain call, when I was sobbing of course). What’s most striking about the show, besides its beautiful narrative, is the music and execution thereof. It is incredible that all of the actors do not only tell a wonderful story each night, but they also play (and dance with!) their instruments and play them seamlessly! 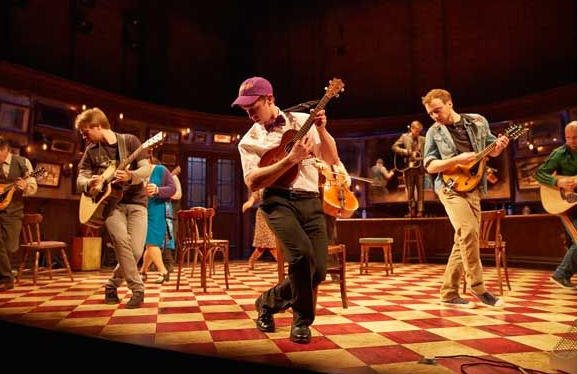 During one of the songs in the show, the lead male character (“Guy”) accidentally broke a string on his guitar. Oh, the magic of live theatre. Seeing it at the Pantages when I was home in August wasn’t as magical as the experience that I had with the show in London (but how could it be?!). It was still WONDERFUL and it was interesting to see it in a bigger venue. Being a 1920s-40s song and tap gal myself, I still am incredulous that I consider it to be one of my favorite musicals…but it is a timeless story with real-life characters and beautiful music – what’s not to love? I am looking forward to hearing Dallas’ response to the show. 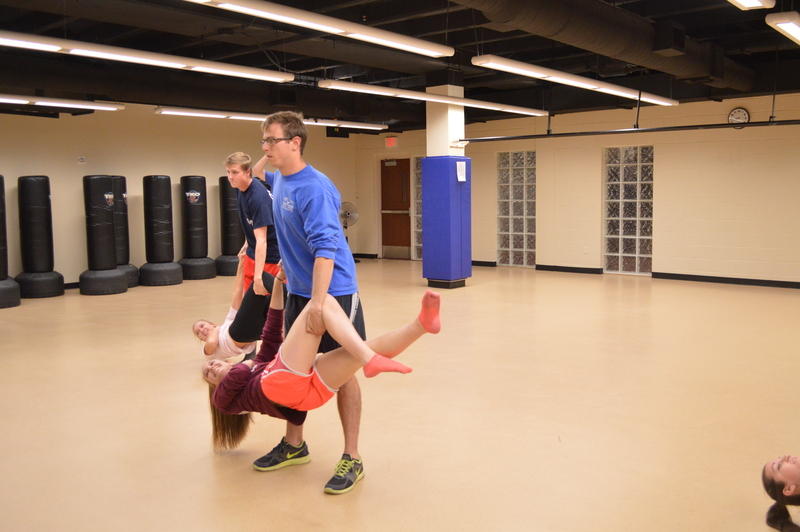 I was lucky enough to sit in on rehearsals and meetings when I covered the SMU Mustang Mavericks a few weeks ago! Stay tuned for my full 3-part story and in the meantime, follow the Mavericks’ whereabouts on WordPress! 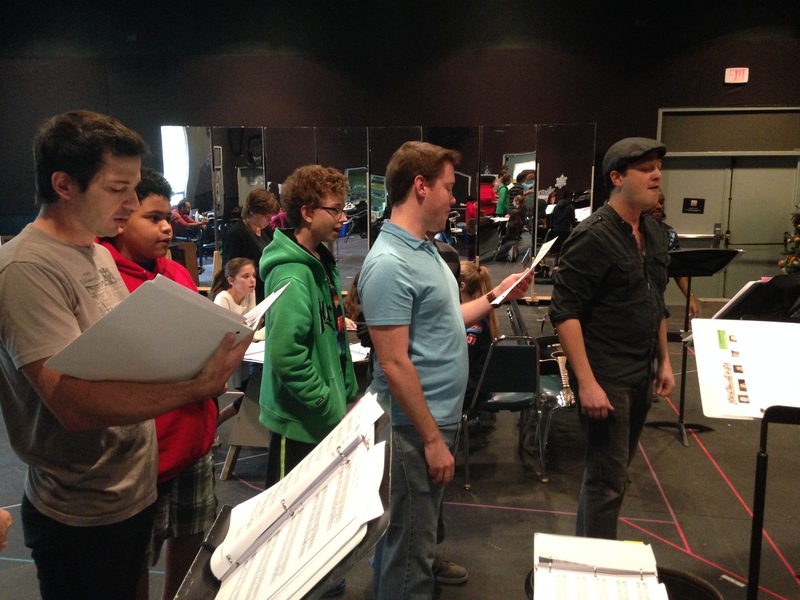 A rehearsal shot from #DTCCarol at Dallas Theater Center. A few more weeks to share in the Christmas spirit with this lovely cast and show! Twelve Days at Night – In a brand-new exhibit, the Dallas Arboretum makes the famous song “12 Days of Christmas” come to life! On the first day of Christmas, what did the Dallas Arboretum give to Dallasites? Twelve Days of Christmas, the first annual Christmas spectacular at the gardens that brings the well-loved song “12 Days of Christmas” to life. Sponsored by the Amegy Bank of Texas, this $2 million exhibit opened on Nov. 16, 2014 and will remain open until Jan. 4, 2015, so don’t miss out while it is here! Most of the twelve gazebos have mechanical animation that brings the story to life. For instance, in the “Nine Ladies Dancing” exhibit, the ladies swirl around with dance cards and in “10 Lords-A-Leaping,” it seems as if the 10 men ice skating on the rink are leaping so much that they may fall over. Each scarf, bowtie and mustache serves a specific purpose in each of the 12 exhibits throughout the garden, which makes it clear that skilled designer Tommy Bourgeois and the employees at Dallas Stage Scenery have a knack for detail and finesse. Don’t miss this exhibit, which will close Jan. 4, 2015. But don’t show any sign of a “bah humbug” when it is over; the Dallas Arboretum plans to feature this exhibit every year for the next five years. Dallas Arboretum and Botanical Garden is located on the southeastern shore of White Rock Lake at 8525 Garland Road, Dallas, Texas 75218. The Dallas Arboretum is also the home of the internationally acclaimed Rory Meyers Children’s Adventure Garden. The Arboretum is open daily from 9 a.m.-5 p.m.
Don’t miss #DTCCarol at Dallas Theater Center, which opens tonight at the Wyly Theatre in the Dallas Arts District. What an excellent week for Dallas theatre! 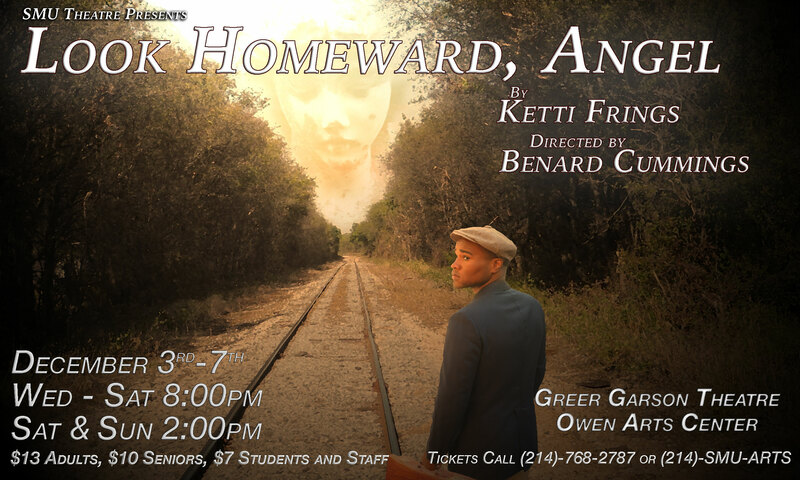 This classic play opens tomorrow night at SMU‘s Greer Garson Theatre, under the direction of professor Benard Cummings.